My brother Nick is a real honey. He keeps bees. He has stacks and stacks of hives and wears a super cool Buzz Lightyear outfit. (Okay yes, I’m a little jealous.) Every year he pulls the hive trays, decants the drippings and bestows golden bottles of his hallowed Hilger Honey on us. Nick proudly proclaims that his bees are special. “They’re all free range, Kath!” he teases with his goofy grin. (Geez, Nick have you ever met a bee that wasn’t?) “Best of all they are happy bees,” he says. “Well, actually sometimes they act like cranky little kids but most of the time they’re so sweet you just want to hug ’em!” Alrighty then, you go right ahead, all I have to say is, you better keep your “Buzz” suit on brother! The world of bees is far more essential and complex than we would ever dream. If it weren’t for hard-working bees, we would not be able to produce much of the food the world eats. Their pollinating makes our gardens, crops and farms flourish. Bees produce well over 1 million tons of honey a year. Their hard work is long lasting too. In fact some say honey lasts forever. 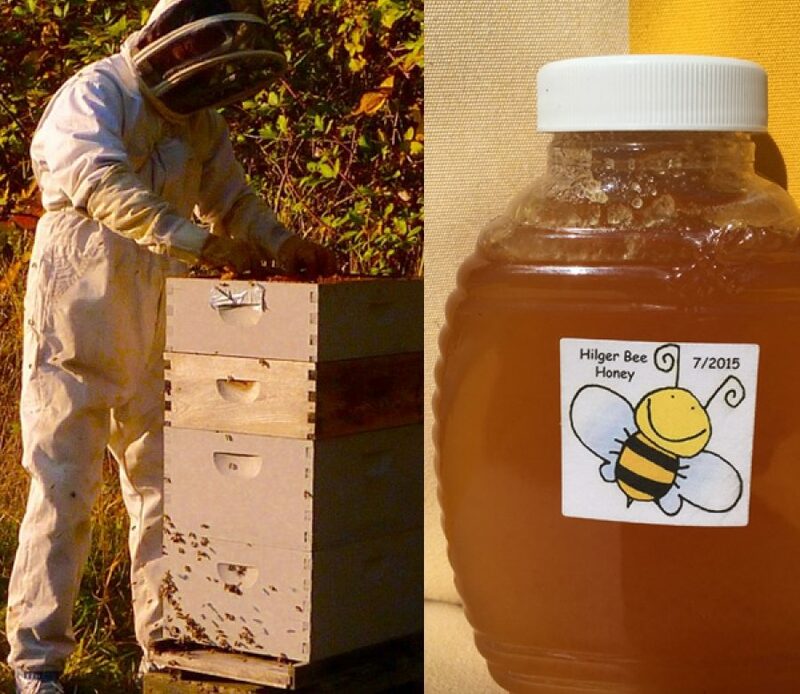 It seems so, because the honey found buried in King Tut’s tomb from thousands of years ago is still edible today! The fact that honey is sweet and delicious is enough for anyone but there is more good news, it is also an extremely healthful food and medicine. It contains both fast-acting fructose and longer-acting glucose to power our bodies’ energy needs. It contains vitamins, minerals, enzymes, antioxidants and proteins. It has no cholesterol and no fat, and it is absorbed into the blood stream slower than sugar (a lower glycemic index.) It is antibacterial, antimicrobial and has long been used for healing scrapes and burns, sore throats and coughs. A nice dose of honey, hot water and lemon is a great tonic to replace many medicines. The best part of honey is eating it. A straight spoonful of syrupy honey is divine but to honor our hardworking busy bees our Salty’s chefs have come up with some great recipes for you to taste. Check out our July 2016 “Wild Ones” Salmon Festival Menu and Recipes including two wonderful recipes using honey. And if you don’t have a honey of a brother like mine, check out Chef Jeremy’s great tips on sweetening your life in his blog this month OHHH Honey Honey.